An MDI file, which stands for Microsoft Document Imaging, is a proprietary Microsoft image format used for storing images of scanned documents created by the Microsoft Office Document Imaging (MODI) program. The program was included with Office XP, Office 2003 and Office 2007. It was discontinued in Office 2010 and above. It has basically been replaced by the Windows Fax and Scan service. Even though MODI was not included with Office 2010, it can still be installed with Office 2010 in a couple of different ways that I will explain further in the article. If you have any of the versions of Office installed that include MODI, the easiest way to view an MDI file is to just install MODI and open the file. If you have Office 2010, you can either install MODI or use third-party tools to view or convert the MDI file. It’s also worth noting that if you have Microsoft OneNote installed on your computer, you can use it to open MDI files without needing to install MODI. OneNote can also perform OCR, so if you were using MODI for OCR, you can now use OneNote instead. To install MODI, go to the Control Panel and click on Add/Remove Programs or Uninstall a program if you are using Vista. If you are using Windows 7 or higher, you’ll need to click on Programs and Features. Next scroll down to Microsoft Office (Professional, Standard, etc) and click on it. Now go ahead and click on the Change button. Make sure Add/Remove Features is selected and then click on Continue. 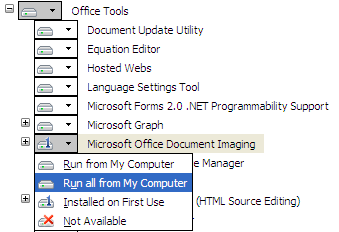 Now expand Office Tools, click on the drop down menu next to Microsoft Office Document Imaging and select Run All From My Computer. This will install MODI and you can now use it to scan, view, annotate and OCR documents. You can open the BMP file and then save it out in a different format like TIFF using MODI. If you have Office 2010 installed, you can still install MODI, but you’ll have to use older media in order to install it. The first way is to simply download a free download from Microsoft called SharePoint Designer 2007. It’s a free download and comes bundled with MODI. When you go to install it, however, you deselect everything except for Microsoft Office Document Imaging like shown below. The other way to install MODI with Office 2010 is to use older Office 2007 media. If you can get your hands on an Office 2007 DVD, then you can run the install, choose Customize and do the same thing as shown above. If you want to convert the MDI file to another format like TIFF or PDF, you don’t necessarily need to use MODI. Microsoft has a free tool called the MDI to TIFF File Converter, which is a simple command line tool. Once there, you can type in mdi2tif – help to see how to use the program. I would suggest simply taking your MDI files and copying them into the C:\Program Files(x86)\modiconv folder before using the tool. If you do this, it will make the command you have to type very simple. The above command uses the source parameter and gives the name of the file. If you don’t add any more parameters, it will look for filename.mdi in the modiconv folder, convert it and output the file in the same directory. There are other parameters you can use, but the only ones that are of interest are dest and subfolders. If you don’t like the command line, you can use a third-party program to convert the MDI to TIFF for you. Free MDI Image Viewer is a tiny freeware program that lets you view MDI files and save them out into other image formats. Download, install it and then run the program. Open an MDI file and then click File – Save As. Choose TIFF from the options. If you don’t want to install any software on your computer at all, then you can use a free online service called Zamzar to convert MDI to PDF, TIFF and many other formats. Zamzar is a great online tool for converting between many different file formats. So those are basically all of your options for opening, viewing and converting MDI files. Unfortunately, there is no online tool that will let you just view MDI files directly in the browser. You either have to download a viewing program or convert the MDI file to another format first. If you have any questions, feel free to post a comment. Enjoy!